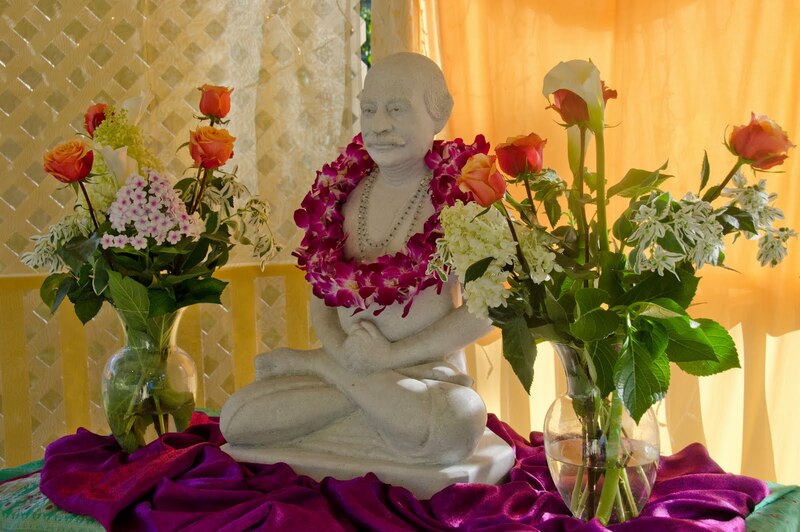 On Saturday our spiritual community gathered together to honor and commune with each guru in our line of masters. We are incredibly lucky to have not only one guru—blessing beyond measure in itself—but five, who illustrate spiritual qualities in different ways through their varied lives and legacies. Asha spoke in front of each shrine, helping us attune to each particular expression of the Divine. We chanted and meditated with each guru, and placed votive candles around them, offering the little lights that are in us into the blazing light of Infinity. 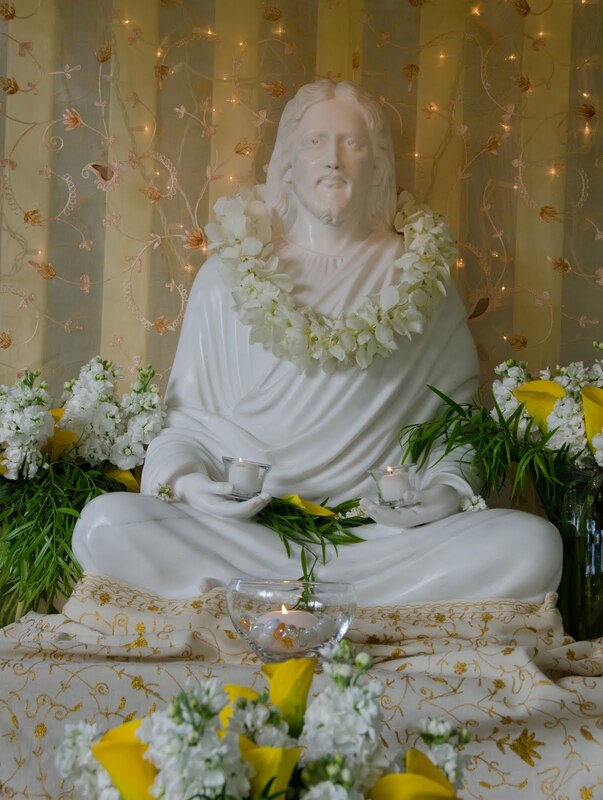 Jesus and Babaji, with their garlands and lights of devotion. 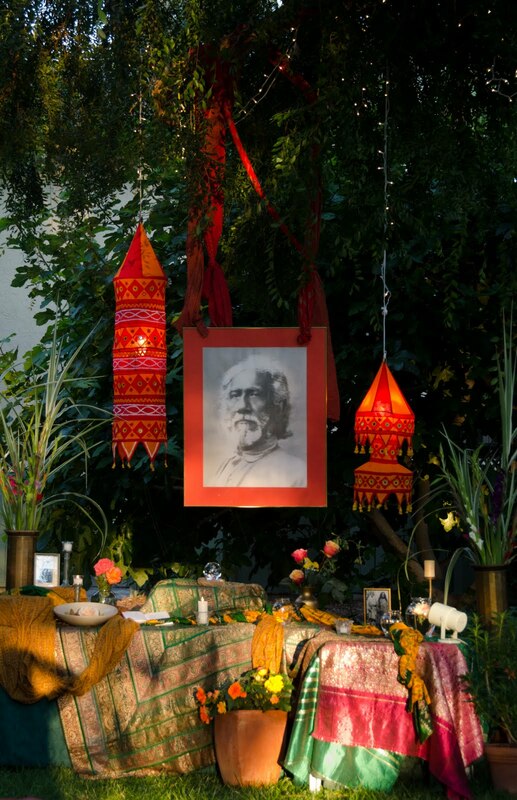 A beautiful new addition this year was a gazebo for Lahiri Mahasaya. 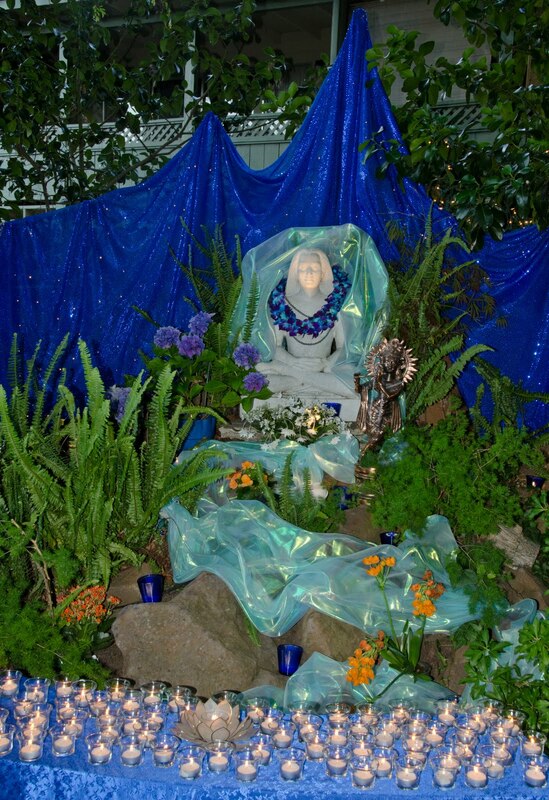 We’ve had his statue for years, but it hasn’t had a permanent home, so this year’s Sadhaka training class has taken up the task of creating this shrine. There’s still painting and roofing to be done, and we’ll share a lot more about the project when it’s finished, but we had enough to decorate it up beautifully for the celebration. We also held a small ceremony, anointing the statue with Ganges water and rose petals, to welcome Lahiri into the space. Lahiri Mahasaya in his new gazebo. 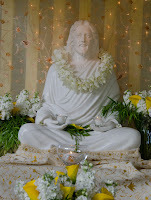 Swami Sri Yukteswar, and Paramhansa Yogananda. 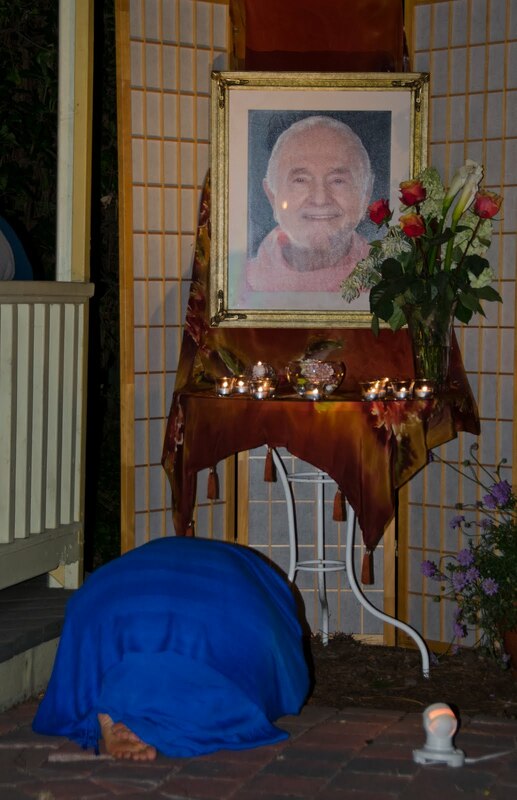 We concluded the evening in front of Paramhansa Yogananda, whose shrine was accompanied by a photo of his disciple, Swami Kriyananda. These two great souls were the channels for bringing the teachings of all our masters to us, and for that we are eternally grateful. Friend and guide, Swami Kriyananda. This past Saturday was the birthday of our very beloved Asha. 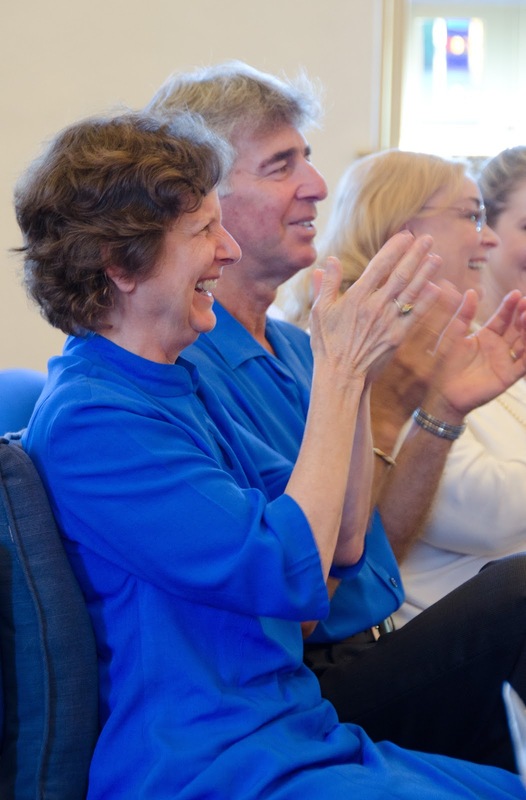 Given that Asha is the choir’s biggest fan, and that we'll take any excuse for some more fun and music, we decided to hold a summer concert in her honor. So this weekend’s Sunday service led straight into a potluck in the piazza, and the concert actually began there as well, with Dambara and Saranya performing Canticle of the Creatures before leading us all back into the temple for the rest of the show. 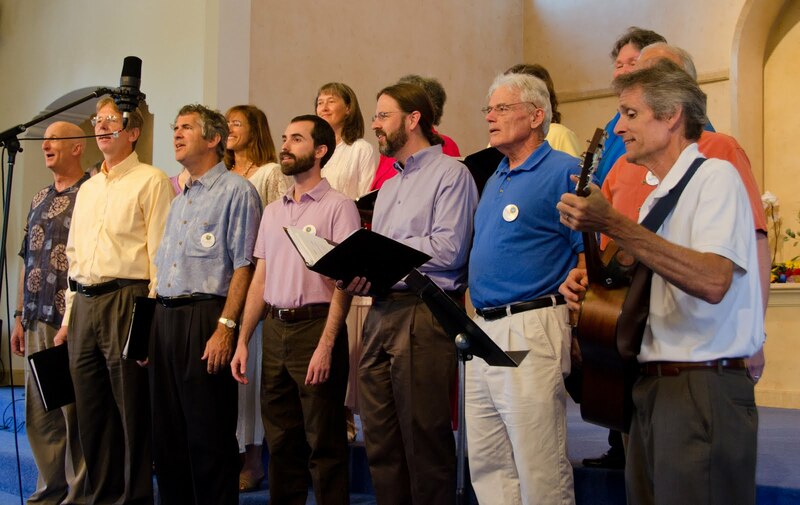 The choir put together an excellent program, based around many Ananda favorites (see a video of Life is a Dream). There was also a gorgeous arrangement of Shenandoah, which we've decided just needs to be adopted into our repertoire. A light-hearted interlude featured surprise, customized birthday songs in both barbershop and Beatles varieties, as well as a must-see skit demonstrating the many, many interpretations of one of our favorite chants. To end the concert, Rita debuted a new choreography to the song Keep Calling Him. 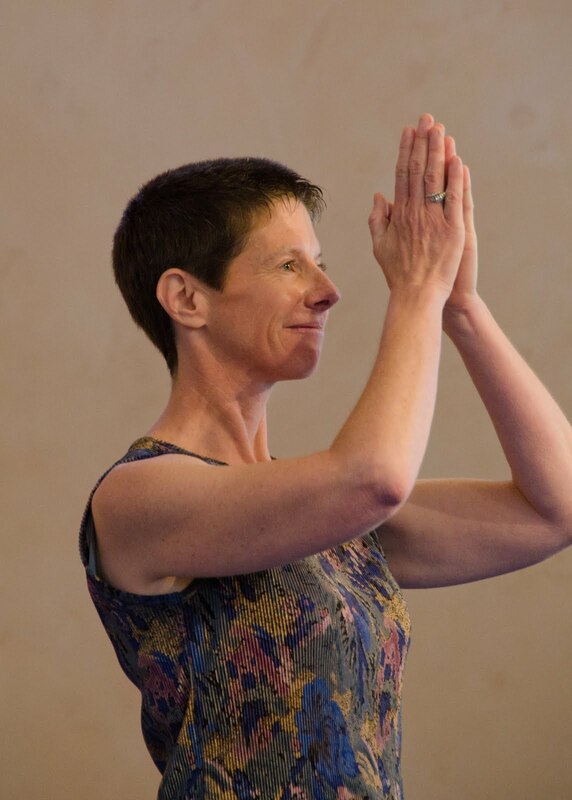 The movements are simple and graceful, and suitable for audience participation, which let us wrap things up with a feeling of connection to everyone in the room. It’s also good to see that dance as an Ananda art form can continue here, even now that Pavani has moved to Portland. The whole concert was recorded for a CD — contact the Sangha staff if you’re interested in getting a copy. 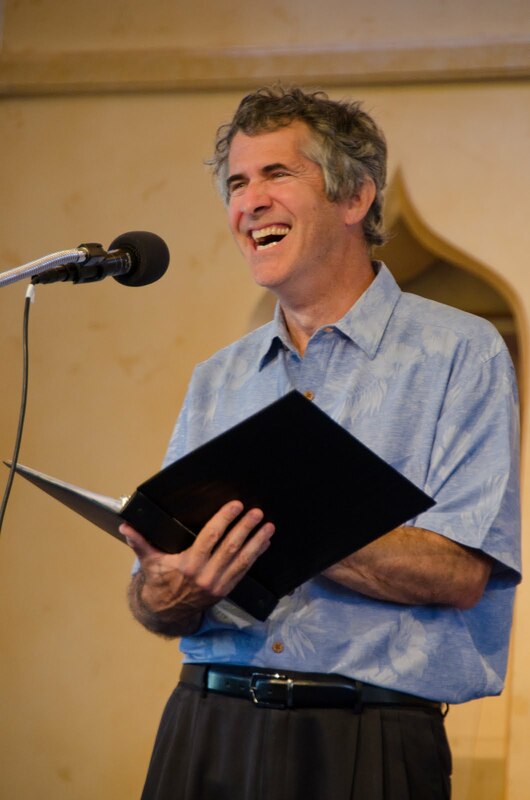 For now, we’ll leave you with a link to all the photos, as well as a sweet poem that David G. wrote for Asha, and read at the concert. So lend me your mind, your heart, and your ear. I speak for us all: love and joy to you! And we can’t forget dessert, of course. The younger bodies effectively dominated the s’mores scene (above), but we also had a sundae bar to pick up the slack. Vanilla ice cream with raspberries and blueberries made an excellent combination for the patriotically-minded, but the brownies and fudge sauce were well worth altering the color scheme. 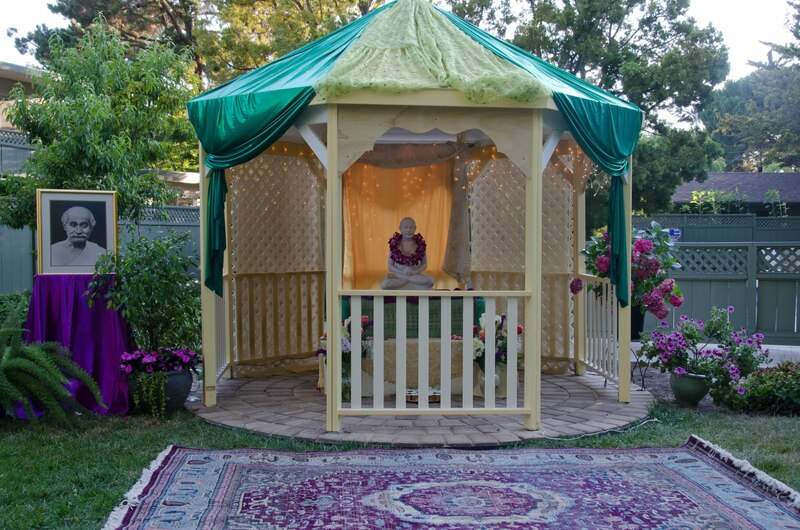 Dinner was followed by an outdoor kirtan in front of Paramahansa Yogananda’s shrine and gazebo. Along with the abundance of voices, we had harmoniums, guitars, kirtals, a flute, a drum, and shakers for the little ones. 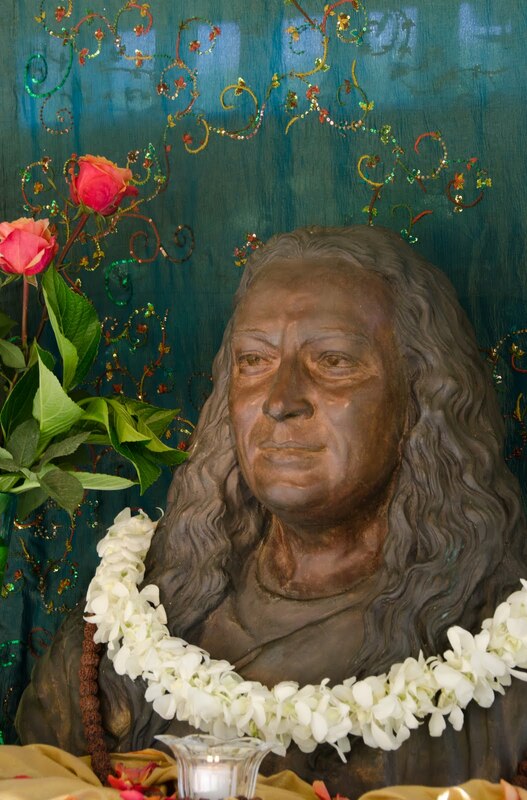 The chants naturally included “Rise in Freedom” and “I Am Free,” along with many other Ananda favorites. Independence Day in America: The political and national freedom celebrated this day were meant to give all men a chance to rise to their own highest potential. Though independence has not been applied universally, it has at least been directional. It has taken time for black people and for women to win the right to vote, though that right should have been recognized and bestowed from the beginning. It is time now to declare a new kind of freedom: freedom of conscience! This declaration can be made only by and for the individual. Let no one pressure you into thinking or behaving as he thinks you ought to. God has a special song to sing through you. It can be offered to the universe only by yourself.